The Cyclades in the Aegean Sea of Greece are highly suited for yacht charters, even more so the southern waters featuring the gems of Santorini, Sifnos, Naxos and Folegandros. There is a vast network of ferries and hydrofoils connecting these islands from Athens (Piraeus port), but it is also possible to fly directly into for example Santorini and Paros instead of a domestic flight from the Athens International Airport. Far more appealing for yacht charters is to sail a oneway (one-way) from Athens or Lavrion towards the south Cyclades, preferably to Milos or Santorini, helped by the prevailing summer winds from the north. Yet, Parikia port on Paros is still the most important base for yacht charters within the Cyclades and is only a very short distance away from the southern most islands. Moreover, the Parikia port is more suitable to keep a yacht, much more amenities and options for repairs etc. The latter is especially important for bareboat yacht charters without skipper in these breathtaking waters. The majority of the yacht charters offered here are upperclass, not cheap, but very luxurious, because the luxury yacht charters appeal more to the tourists attracted by the glamorous, yet romantic image of Santorini. See my yacht charters guide, which allows you to choose between the various options like: skippered, bareboat (bare boat), fully crewed, assisted bareboat and flotillas. 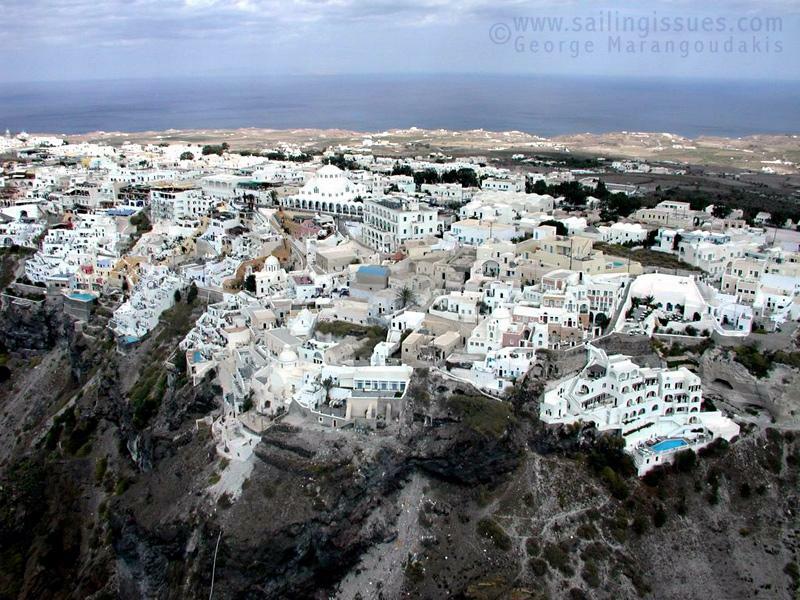 Note, that the Cyclades and most certainly the area around Santorini are quite advanced, and only the experienced sailors should go bareboat in these waters, specially during the summer months when there is a higher occurrence of stormy weather. Indeed, the pre-summer month of June is optimal in many ways and is generally considered the best time to sail Greece.